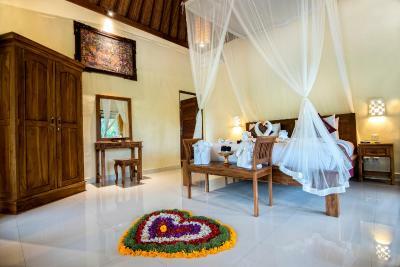 Lock in a great price for Pajar House Ubud Suite & Villas – rated 8.8 by recent guests! Such an amazing 2-day visit to Pajar house! The staff really did everything in their power to make our stay memorable. It was my birthday weekend and they sent a cake to my room and even sang to me! WoW!! 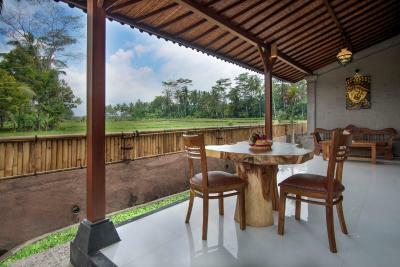 Our villa room was amazing; enjoying our breakfast overlooking the rice fields was truly serene. Staff were great, very helpful. We stayed in the villas, very secluded which was great to have some privacy and get out of the city. Pool is a great added bonus. Would definitely book again despite some negatives we experienced. Very nice hotel. The room was clean and the bathroom beautiful. The staff was very helpful. There are motos to pick up you until the center of the city. Great breakfast. Good location for relaxing and the place is awesome. Good hospitality. The staff, the location, the ambiance, and all the services were impeccable! Great value. 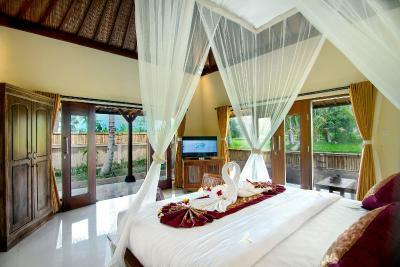 I would stay there everytime I return to Bali. I couldn't thank them enough. 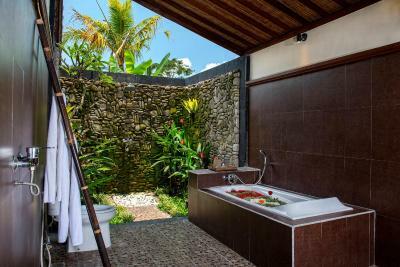 Pajar House Ubud Suite & Villas This rating is a reflection of how the property compares to the industry standard when it comes to price, facilities and services available. It's based on a self-evaluation by the property. Use this rating to help choose your stay! One of our best sellers in Ubud! Located in a traditional Balinese village in Ubud, Pajar House Ubud & Villas offers accommodations with landscaped gardens. 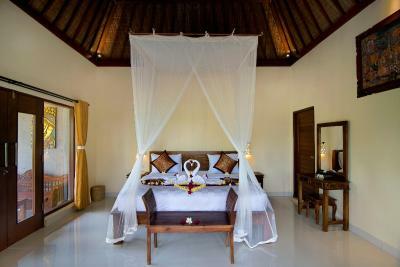 It features a blend of Balinese-style architecture and modern interiors. Guests enjoy free WiFi access in the room and throughout the property and free use of bicycles. 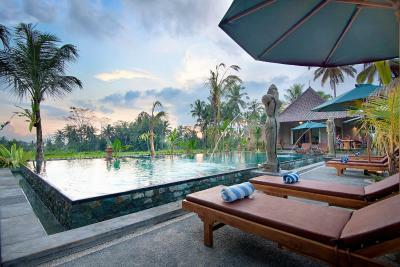 The property also offers free shuttle service to central Ubud, located a 15-minute drive away. 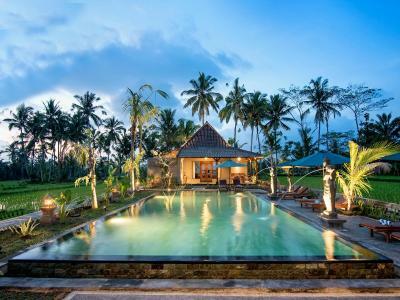 A 25-minute drive from Pajar House Ubud & Villas leads to the sacred Monkey Forest, while Ngurah Rai International Airport is 1.5-hour drive away. 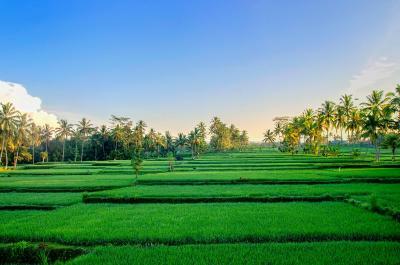 Free shuttle service to downtown Ubud is provided for guests’ convenience. Fitted with a private terrace overlooking the greenery, each air-conditioned room comes fitted with mosquito nets, flat-screen cable TV with international channels and a fridge. Private bathroom provides slippers, free toiletries, bath and shower facilities as well as freshly laundered towels. Day trips, car rental and airport transfers can be arranged at a fee, while on-site parking is provided free of charge. Laundry service is also available. Other on-site conveniences include massage service, valet parking and luggage storage facilities. 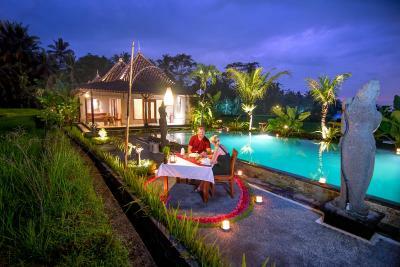 The nearest restaurant is reachable by a 10-minute walk from Pajar House Ubud & Villas. 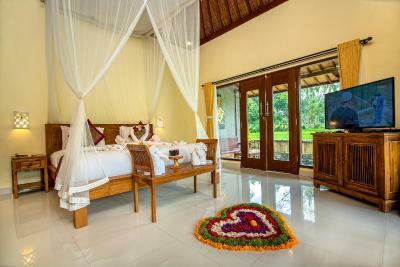 When would you like to stay at Pajar House Ubud Suite & Villas? 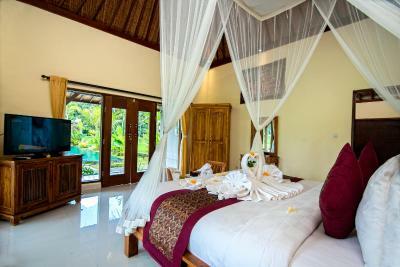 Fitted with a private terrace overlooking the garden, this larger air-conditioned room comes fitted with mosquito nets, flat-screen cable TV and a fridge. Private bathroom provides free toiletries, bath and shower facilities as well as freshly laundered towels. Please note that this room type is a 4-minute walk from the reception. 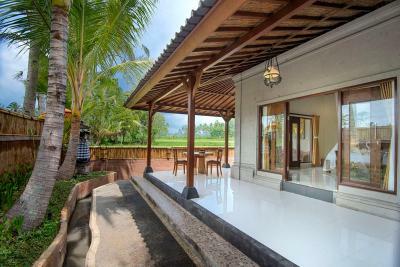 Surrounded by rice paddies, this tranquil 1-bedroom villa offers a living area with a flat-screen TV with DVD player, terrace and a private bathroom with bath or shower. Please note that this room type is a 3-minute walk from the reception. Please note that this villa is a 5-minute shuttle bus ride from the other room types in the property. The staff will organize the shuttle upon arrival. Rooms are 40 square yards. 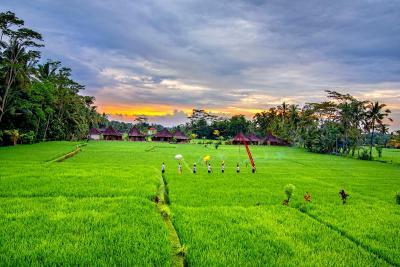 It has rice field view. Please note that this room type is a 5-minute walk from the reception. 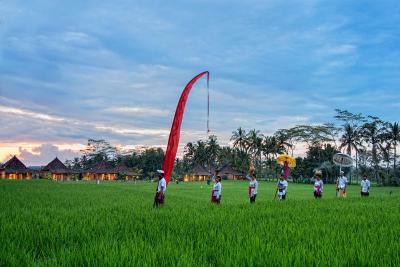 House Rules Pajar House Ubud Suite & Villas takes special requests – add in the next step! Pajar House Ubud Suite &amp; Villas accepts these cards and reserves the right to temporarily hold an amount prior to arrival. Pajar House Ubud Suite & Villas accepts these cards and reserves the right to temporarily hold an amount prior to arrival. Please note that guests staying at the Standard Double Room and Deluxe Double Room can use the villa swimming pool free of charge. Please note that the property is spread in 3 different locations within a 5-minute drive from each other. Breakfasts are not reach. But for the hot weather is enough. Amazing and relaxing atmosphere. Rise fields around the Hotel. At night small green fireflights flight across the fields. 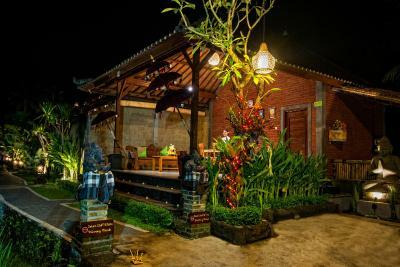 Very quiet and cozy place, not far from Ubud. Free transfers every hour. Nice staff. Thank you! Everything was above expectations. However, I agree with a previous comment that it would be lovely if the managers could help to eliminate plastic from Bali. We don't need plastic forks or straws! Family run, friendly, and very efficient. Calm and peaceful atmosphere. Small but refreshing swimming pool. Food available which was very good and well presented. Excellent value for money. 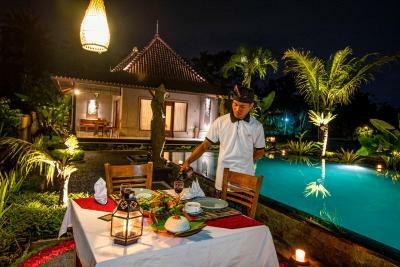 Staff happy to take you to local restaurants as well as Ubud centre. The only suggestion I can make is that they continue to try to be more environmentally friendly. I was a little disappointed to see plastic straws and picks at breakfast. Please use bamboo straws and place jam in bowls rather than use the little plastic tubs. Help us eliminate single use plastic from Bali! Everything! The location, the staff, the pool, the room.... it was all excellent. 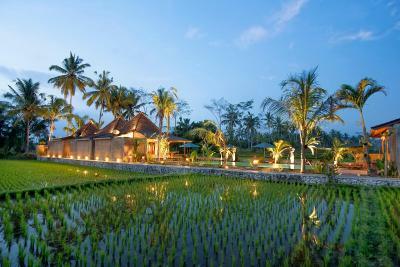 This will be our ‘go to’ place in Ubud from now on. I accidentally left a sarong in the wardrobe and a staff member chased us almost all the way into Ubud to bring it to me. I was amazed! Thank you for a wonderful stay. Too many ants. But yeah you’re staying in the middle of the paddy fields right? The toilet & the hospitality. Staffs were very helpful & friendly. 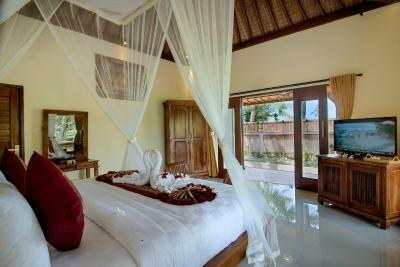 IPlease choose their villas for the best experience! The bathroom was nice but exposed to the elements so when you went to the toilet through the night the mosquitoes bit and the spiders were out as well. Also the food we ordered arrived cold and one oder was completly wrong at breakfast. Also we wanted to swim in the pool but the water was green, full of algae and had no chlorine in it. We have our own pool at home and know how to maintain it, and theirs was not at a safe level to swim in. The morning we left someone was putting chemicals in it but that didnt help us the 2 days beforehand😔 Also the only way to the accommodation is to walk the 300 meters from the road or ride on the back of the motorbikes and that wasnt fun it the rain. The unit next doors occupants coversation was very loud and could be heard through the walls. The location is amazing. Its quiet peaceful and what we wanted to see. The staff are friendly and happy. The price we paid for the accommodation was good value for the style of room. The food wasn't good. The breakfast was OK but we ordered the beef burger one day for lunch and it wasn't eatibe. The location is beautiful if you are looking for a relaxing couple stay. 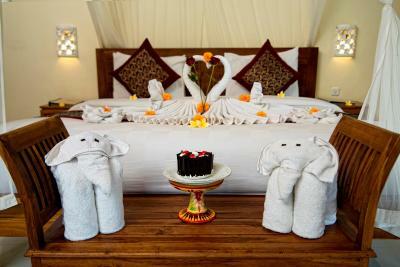 The Staff are all very friendly and the room was very clean. The hotel gives out a phone for the duration of your stay so you can call them easily if you need anything. Massage also very good. Really? I couldn't even make something up even if I wanted to; which clearly I don't. The resort is divided into two properties that lie 500+ meters apart from each other. We ended up staying at the property where the small swimming pool was located, but the hotel offers a free scooter taxi service to drop you off if you'd like to swim in the other pool or take a look at the other location. 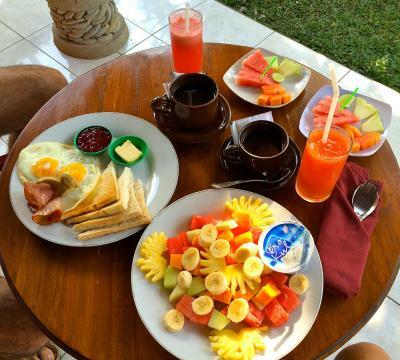 Best breakfast we've had in Bali and awesome decoration of the room. Very beautiful room too! Very big and romantic. Swimming pool was lovely as well. The staff in the hotel was fantastic, very friendly, everytime smiling, very supportive regarding trips organisation and transport. 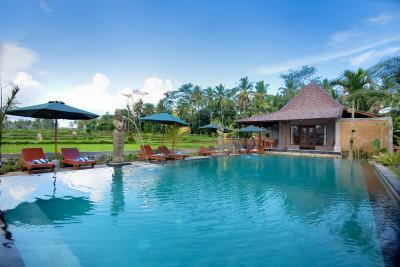 The place is nice and the hotel is providing regular shuttle to Ubud City for free. Very close you can find out Labak Sari (good and cheap restarurant with the best coffee we tasted). 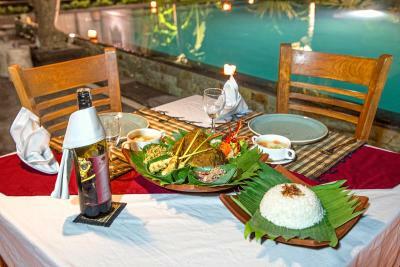 In the Ubud City you can find out the market and lot of restarurants and shops (we can advise for italian restaurant UNO, A legend restaurant etc.). We had the room deluxe in the city (not villas in the rice field) and we had the pool only for ourselves. The rooms were big and cleaned regularly. 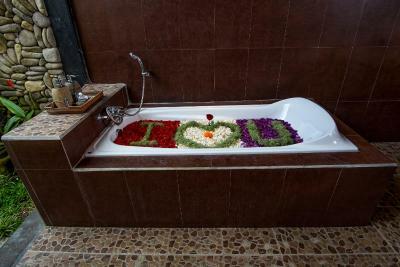 Lovely rooms, beautiful bathrooms, friendly staff and great shuttle service to Ubud. To reach to the rice field villas, we had to get a ride on a scooter which I was not a fan of. The little narrow path to the villa was in the middle of two large canals which was flushing with water when it rained. We weren't informed about this until we get to the property! I booked two different room for myself and my parents, only to find out that the villas and the main accommodation were in two separate location making communication difficult. On top of that the Wifi didn't really work. The breakfast was ok, the utensils weren't clean, and no, im not a Hygiene Police, but our pots had mud on it when served. Our parents complained about how the clothes which they used to hold the utensils had a bad smell. 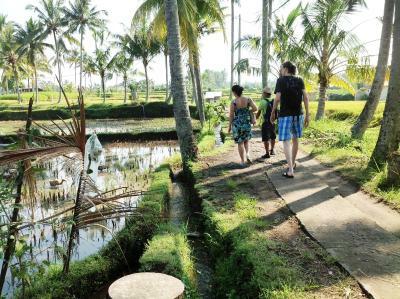 Using a scooter to get from the rice field villas to the main accommodation was really not cool, we were lucky that it did not rain so much when we were in Bali, otherwise it would be a really bad experience for us. This is a beautiful find.....tranquil and gorgeous views from the pool area. The staff were very attentive and the shuttle to town and back was a great asset. We also ate an evening meal here one night as the outside dining areas were very relaxing and attractive. Nothing was too much trouble. Solo traveller, I stayed in the cheapest room and it was large but absolutely no natural light. The entrance doors into the room were two little wooden doors that locked with a padlock. So no light comes into the room which is very depressing. Location was kind of isolating too so was stuck in my room most evenings. I was so happy to leave after 4 nights. 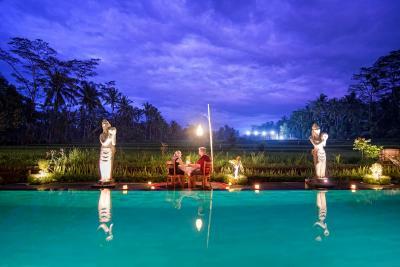 Ubud in general is not somewhere I’d recommend you stay in for more than 2/3 nights. Once you’ve seen the monkey temple and done the swing and maybe some tours there isn’t much. They provided a free shuttle bus service into town and mobile for use whilst there. The room was nice enough. Everything was perfect! Great romantic place.